Frequently, an informative and sentimental letter to the editor appears in The Star-Ledger from an elderly Newarker reminiscing about some forgotten chapter in the city's history. Quite naturally, we think that here is the oldest living thing associated with Newark. Not so, for the oldest living things are some of our fine old trees. Several Newark trees pre-date the Revolutionary War. For example, the 'Washington Sycamore or plane' tree, growing in Military Park along Broad Street near the entrance to the parking garage, is believed to have been standing there when Gen. George Washington visited Newark. As Newark began to industrialize at the beginning of the last century, many trees disappeared in the path of so-called progress. Still, the town retained a certain bucolic charm as evidenced in an article in the Northern Monthly in 1867, which talked about Newark's tree population in the following way: 'The first peculiarity that strikes the eye in this scene is the omnipresence of shade trees. The city is almost embowered with green.' In addition to the general impression of greenery along Newark's main street, many notable trees became landmarks for future generations. Their passing was mourned by those who knew and loved them. From the earliest period of the city's history, no tree survived that bears an 'N' notched by the first settlers. Local newspaper files are filled with references to trees that have disappeared as a result of age, disease or neglect. The black walnut tree in Doane Park was 100 years old when President Abraham Lincoln visited town. The 'Jackson Hickory' at 95 Clinton Ave. was planted in 1828 to honor 'Old Hickory' President Andrew Jackson during his presidential campaign, and the 'Napoleon Willow' was brought half-way around the world from the emperor's tomb at St. Helena to find nourishment and grow in Newark soil. Sarah and Caroline Condit, daughters of one of the founding families, cherished an ancient elm in Military Park, only to see it felled by age. An ancient plane tree in Washington Park, which witnessed the British raid on Newark Academy on the night of Jan. 25, 1780, came down in the 1970s. At Roseville and Fourth avenues, a stand of plane trees survived from the days when Camp Frelinghuysen was a training spot for Civil War regiments. Now they are gone. The 'Bulletin Elm, ' an enormous tree in front of Old First Church and the last survivor of the Broad Street elms, was located near one of Newark's busiest intersections early in this century. So severe was the Dutch elm disease at the turn of the century that it looked for a while like Newark would eventually lose much of its green carpet of trees. 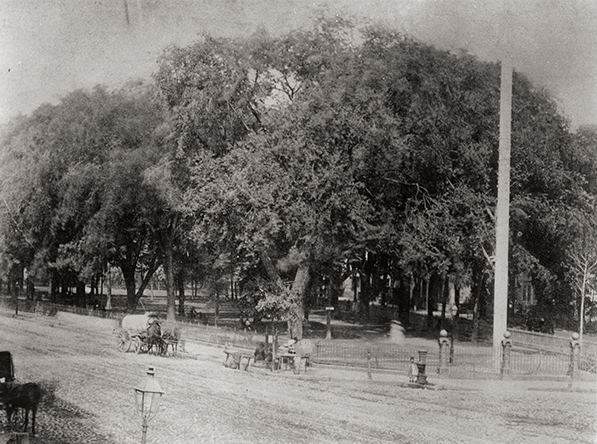 To help save the city's remaining trees, the Newark Shade Tree Commission was created in 1904, based upon the New Jersey Shade Tree Commission Statute of 1893. The statute granted the authority to enact ordinances for 'the protection, regulation, and control of the city parks and shade trees.' In 1917, the commission was absorbed by the Department of Parks and Public Property. It later became the Shade Tree Division. Charles G. Titsworth was a prime mover behind the effort to get Mayor Henry M. Doremus and the Common Council to create the new agency. He, along with J.H. Bacheller and James A. Berry, served as its first nonpaid commissioners. The following year, Carl Bannwart was appointed commission secretary. Bannwart is credited with drawing public attention to the trees and for planting thousands during his career. During the commission's first decade, '27,000 young trees were planted along 180 miles of city streets.' The following varieties were recommended for sidewalk planting: the Norway maple, the Oriental plane, the pin oak, the red oak, the silver linden, the honey locust and the pyramidal oak. Rejected were the Carolina poplar, along with the silver and sugar maples. This was also a time for beautification of the parks. In 1927, Newark's great philanthropist Louis Bamberger and his sister, Mrs. Felix Fuld, were largely responsible for planting the now world-famous cherry trees in the section of Branch Brook Park located in the city's Forest Hill section. In 1958, seven years before Newark celebrated its 300th birthday, Military Park was almost completely excavated for a three-level underground parking complex. Only a small portion of the park was left untouched – the area that contained the 'Washington Sycamore or plane' tree. Experts were called in to save Newark's oldest tree, said to have stood on the Commons when Gen. Washington and later President Lincoln visited town. While there may be older trees in town, the Washington plane is certainly the most visible. Wars, disease and neglect have taken their toll on this old tree, but it survives, as does the city, with a lot of luck, some love and help from the city and friends.